The now-trendy resort town of Galveston is located on a barrier island just two miles off the coast of Texas in the Gulf of Mexico. It's not just well-known for its 32-mile-long beach shaped by wind and waves, but also for its charming Victorian architecture scattered throughout the downtown historic districts. Once one of the wealthiest cities in Texas and the "Wall Street of the South," Galveston was nearly swept away by a devastating hurricane in 1900, which killed more than 6,000 people. In 2008, Hurricane Ike made a direct hit, damaging 75 percent of the city's homes and causing more than $3.2 billion in damage. But, the city's 17-foot seawall (a must for strolling), which was built after the 1900 storm, held up to Ike, preventing total devastation, and the waterfront town of Galveston has once again returned to its former glory. With its visitor-friendly historic district and a host of attractions, ranging from a massive water park to an indoor rainforest with 1,000 species of exotic plants, Galveston offers cruisegoers enough to do to fill a couple of pre- or post-cruise days. Very few ports are as walkable as Galveston; the downtown area of the city is literally right across the street from the terminal buildings. 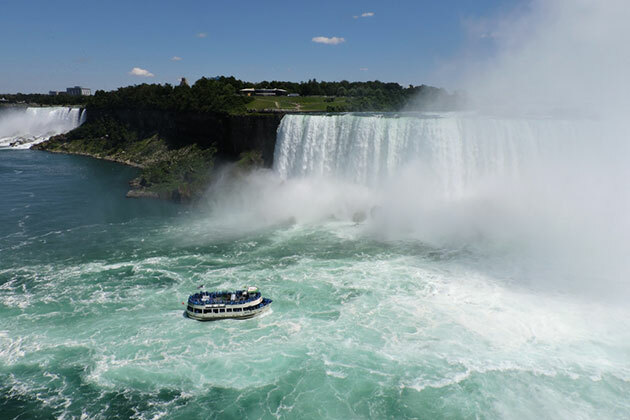 The proximity of the port to many sightseeing-worthy venues is a definite plus. For example, several neighborhoods on the National Register of Historic Places are within walking distance, including the Strand District, where you'll find plenty of shops and restaurants amid Victorian iron-front buildings, and the East End District, where you'll spot exquisite gems like Bishop's Palace. You'll dock at the Port of Galveston on Harborside Drive. If you're sailing on a Carnival ship, you'll be embarking your ship at Terminal 1. If you're on a Royal Caribbean ship, head to Terminal 2. Editor's Note: On days when two ships are in port (usually Sundays), it's best to arrive between 1:30 p.m. and 2 p.m. to avoid the crowds. A total of $65 million has been invested in expanding and improving the terminal, which includes a huge passenger waiting area (to accommodate passengers during fog delays), expanded check-in stations and VIP check-in. Large wall signs with area maps have also been hung around the facade of the terminal building; codes on the maps are able to be scanned with cell phone applications for easy navigation of the city. Another $12 million worth of improvements is in the works for things like adding terminal-wide Wi-Fi. Additional improvements currently being undertaken include construction to turn a nearby parking garage into an area for restaurants, complete with a bridge from the building straight into the cruise terminal; LED signage to direct arriving passengers to proper parking areas; and promotional materials that include bus wraps. The terminal is very close to the Strand and all the beaches and attractions. You'll find in town all the usual services, such as telephones, ATM's, etc. Although Galveston is small and its people polite, be aware of your surroundings, don't wear flashy jewelry, and leave unnecessary valuables (including excessive amounts of cash) in your cabin safe. If arriving by car and touring for the day, don't leave luggage in plain view. 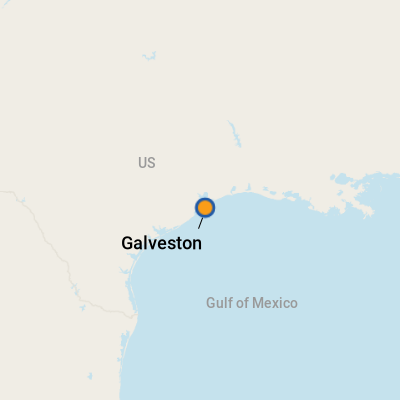 The George Bush Intercontinental Airport (IAH) is about 70 miles (roughly 1.5 hours) from Galveston. Hobby Airport (HOU) is closer at about 40 miles (45 minutes to an hour), but there are generally fewer flight options to and from Hobby. At either airport you'll find all the major car rental agencies, such as Enterprise, National, Avis, Dollar, Thrifty and Hertz. At George Bush Intercontinental Airport (about an hour and a half from Galveston), major car rental companies are located in one common area called the Consolidated Rental Car Facility. Look for the white-and-maroon shuttle buses. Editor's Note: There's an Enterprise car rental location near the cruise terminal, so it's possible to rent at the airport and return in Galveston. Parking is available at the cruise terminal and will run about $10 a day. Free shuttle service from the parking facilities to the piers is available. limousine companies include Karr Limousine and Action Limousines. Taxi service from both airports is another option. The fare from Hobby is $95, and from George Bush Intercontinental, $160, plus tip. (The fare is not dependent on number of passengers; a family of four pays the same as a single.) There are a number of taxi companies in Galveston: Busy Bee (409-762-8429), Yellow Cab Company (409-763-3333), Jeff's Cabs and Shuttle Service (409-621-5222) and Tropical Taxi (409-621-4000). Cruise lines typically offer motorcoach services between the airport and Galveston; these are generally available both as part of air/sea packages and a la carte. Galveston is a walking paradise, but if you prefer to get around on wheels, consider Island Transit, the city's public transportation system. It operates daily, covering 27 square miles, and stops at designated bus stops and intersections. Fare is $1. Service along most routes runs from approximately 6:15 a.m. until about 7 p.m. (The Bayou Seawall Loop runs until about 11 p.m.) The Galveston Trolley was severely damaged during Hurricane Ike, and it is currently being repaired. As Galveston is part of the U.S., the currency is the U.S. dollar. International visitors will find it easy to access cash at numerous ATM machines. Exchange bureaus so common in Europe are not in the U.S., but major banks also provide exchange services. Most banks are open Monday through Friday from 9 a.m. to 5 p.m. Some are open on Saturday mornings. Galveston is known for its large collection of 19th-century architecture; pick up picture postcards as souvenirs. Or, see a performance of the Galveston Symphony Orchestra or Galveston Ballet at the historic Grand 1894 Opera House, and keep your program as a memento. If you're a little more irreverent, pick up a "Galveston -- Just like the Glenn Campbell song, but totally different" T-shirt at the Bishop's Palace gift shop. Another option for anyone with a sweet tooth is a bag of candy from LaKing's Confectionery, located on The Strand.